turned leg, in such forms as those shown on Plate I. and Figs. 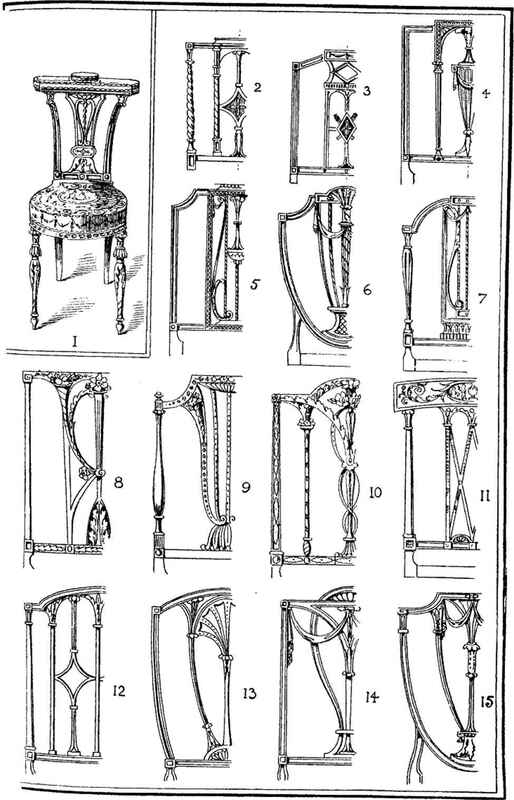 1, 14, 15, and 16, Plate III., while Heppelwhite almost invariably cultivated the square, though there are exceptions, to which reference has already been made (see page 142). 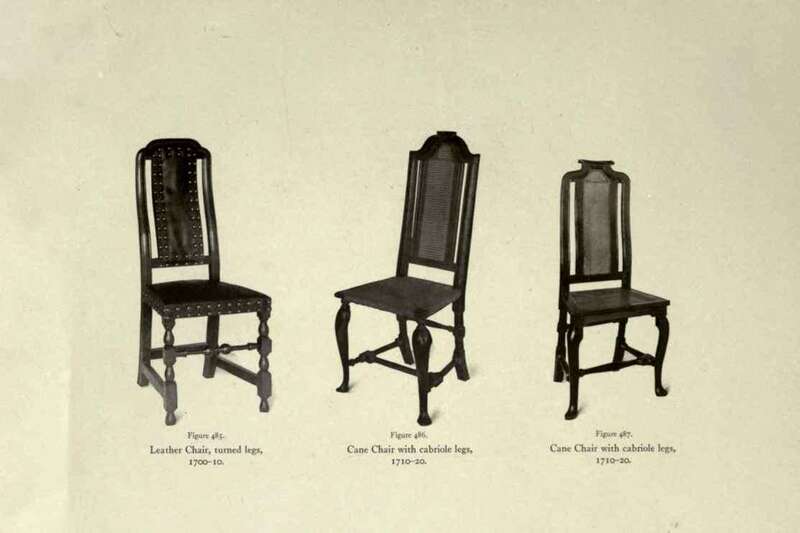 Furthermore, it is most exceptional to discover a genuine "Sheraton" chair with underframing—that is to say, with-rails from leg to leg, placed about six inches from the ground, in order to strengthen the lower part—though in some by contemporary makers, based on his style, that feature appears. Those, however, we shall consider in another chapter. The details employed by Sheraton are, as I have said, closely related to those originated by the creators of the " Louis-Seize/' This is natural, for are they not the outcome of a union between the ideas of this designer and that of his French confrères in the craft ? It necessarily follows, therefore, that they are distinguished throughout by extreme delicacy and refinement. The reeded and fluted leg, twisted pillar, husks, festoons or "swags" of drapery and flowers; the vase, cornucopiae, and acanthus-like foliations, constituted for the most part his stock-in-trade in this department ; but he elaborated them, rendering them according to his own taste, and disposed them with rare skill, almost always stamping them to a greater or less degree with the mark of his own individuality. originally embellished them. Some, it is true, have survived almost in entirety, and time has been more than kind to them, deepening the tone of the wood and endowing the colours with a dreamy softness that is altogether beautiful, and impossible to imitate; but the rest have gone the way of most earthly things, helping to verify the truth of the old adage, u Tout lasse, tout passe, tout casse." Throughout his best work Sheraton never, under any circumstances, permitted the ornament which he employed to take the place of construction, but always made a point of keeping it absolutely subservient to the general form and main constructive lines of his designs. In the enrichment of his productions he was a decorative artist in the strictest sense of the word; he never gave way to the temptation, which must have assailed him equally with every designer at some time or another, to trespass beyond the limits imposed by the materials in which his ideas were to be carried out. In this respect he differed greatly, I need hardly say, from Chippendale, who frequently erred in the contrary direction as has been indicated ' in preceding chapters. What does "tout lasse, tout passe, tout casse" mean?